Play your part as a dedicated Spurs fan in training, the gym or casual games with your mates by wearing with pride the Tottenham Hotspur 16/17 Home Football Shorts, made by Under Armour.The official home shorts of North London Premiership club Tottenham Hotspur come in Cadet Blue and features Black, Gold and White stripes running down the sides of them. For a secure and comfortable fit, they feature an elasticated waist with adjustable interior drawstrings. 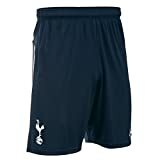 Embroidered upon the leg, of course, is the iconic club badge.Made from lightweight polyester, Under Armour HeatGear technology incorporated within the fabric of these Spurs shorts is designed to help keep the wearer feeling cooler, drier and more refreshed during the intensity of a match by wicking sweat away from the skin and quickly evaporating. Perfect for completing the full kit, when you’re in action on the field make sure you’re proving your loyalty to Spurs with the Tottenham Hotspur 16/17 Home Football Shorts.